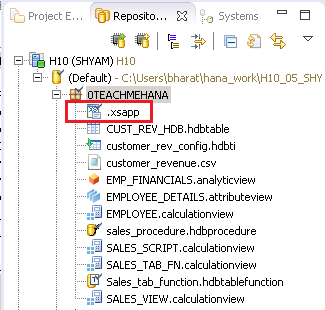 Welcome to the Part-2 tutorial on SAP HANA XS Jobs. In the Part-1 tutorial, we have already learn what an XS Job is and why it is used. Be sure to check it out before reading this one. In tutorial, we show you how to create a job file. 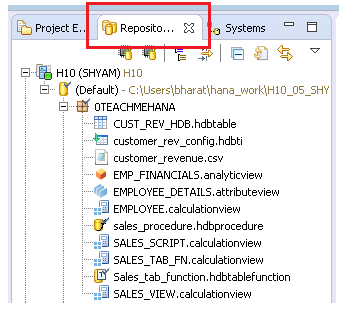 XS Jobs are a SAP HANA development object which basically means that it can not be created in the Systems tab, Switch to the repository tab in the development perspective as shown below. If are creating an XS object for the first time in a package, there are 2 configuration files (.xsapp and .xsaccess files ) you must create before we start with the XS JOB. Remember, this is only a one-time activity for your package. As you can see in the screenshot above, there is no .xsapp or .xsaccess file currently in the package. These are needed for the XS files to execute. Each application that you want to develop and deploy on SAP HANA Extended Application Services (SAP HANA XS) must have an application descriptor file. 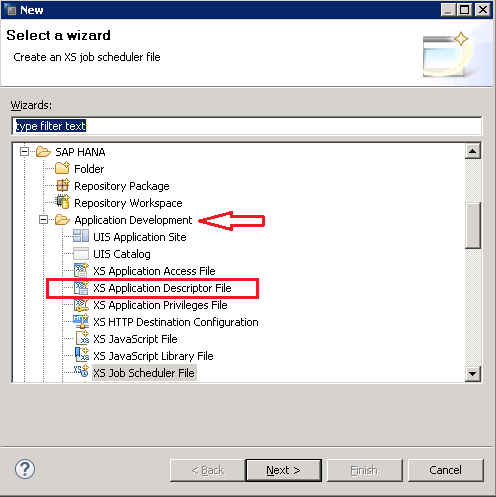 The application descriptor is the core file that you use to describe an application’s framework within SAP HANA XS. 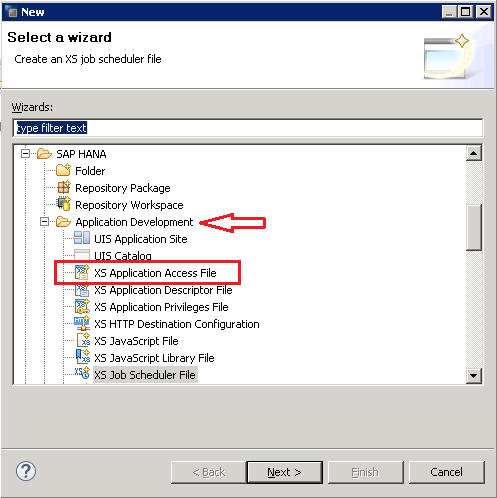 The package that contains the application descriptor file becomes the root path of the resources exposed to client requests by the application you develop. The application-descriptor file has no name and no content; it only has the file extension “xsapp”, for example, .xsapp. For backward compatibility, content is allowed in the .xsapp file but ignored. Right click on your package name and select New Other from the context menu. You can either search for XS Application descriptor in the search bar or find it under the “Application development” folder as shown below. Click “Next” when done. As explained earlier, you don’t need to provide a file name as the there is no file name. It only has an extension – .xsapp. This is also automatically written into the “File Name” by the HANA system as shown below. You are not allowed to modify it. Press the finish button. A blank file will open up. Press the activate button as shown below. As seen below, the .xsapp file has now been created. And yes, that was not a joke. We just activated a blank file. It’s just something that has to be done due to some backward compatibility issues. Let’s embark on our next journey – to create an xsaccess file. SAP HANA XS enables you to define access to each individual application package that you want to develop and deploy. 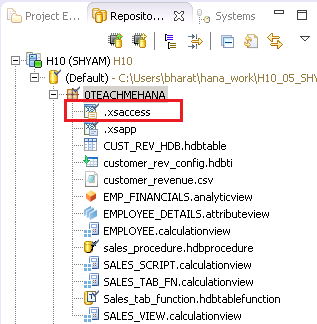 The application-access file enables you to specify who or what is authorized to access the content exposed by a SAP HANA XS application package and what content they are allowed to see. For example, you use the application-access file to specify if authentication is to be used to check access to package content and if rewrite rules are in place that hide or expose target and source URLs. As in the previous case, right click on your package and navigate to New Other in the context menu. 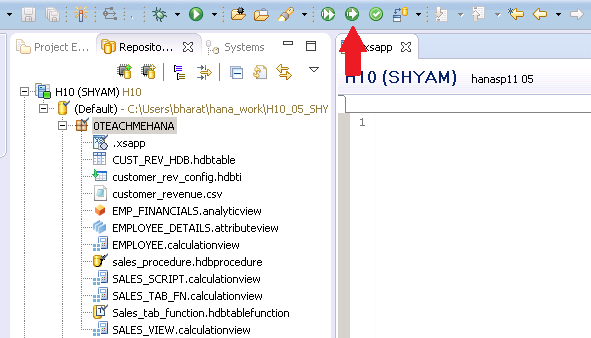 Type XS Application access file in the search bar or find it in the Application development folder and click “Next”. The file name is disabled as again, there is no file name. There’s just an extension – .xsaccess. Make sure the template is set to basic (which is the default setting anyways) as shown below. 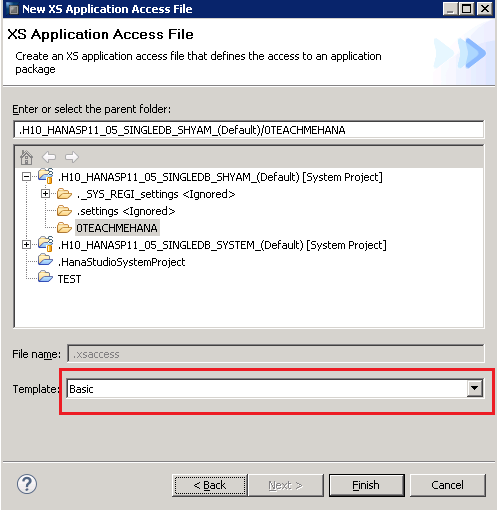 This gives you the default configuration of the xsacess file as shown below. The code is auto-generated and I have not modified anything here. 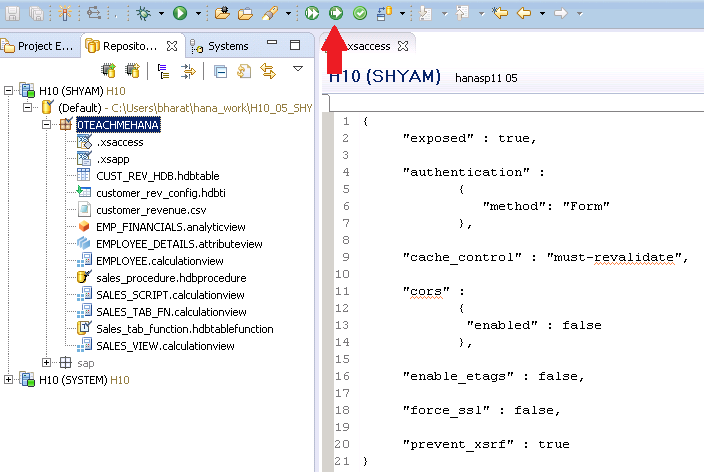 This file controls how the external applications communicate with HANA. There are special scenarios where we would need to change these settings but mostly the default settings would work just fine. Press the activate button marked by the arrow below. As seen below, now we have the .xsaccess file as well. This completes the one-time configuration step we needed to do for this package. Any number of XS files can now be created in this package without repeating these config steps. Now, we are ready to build our XS JOB. 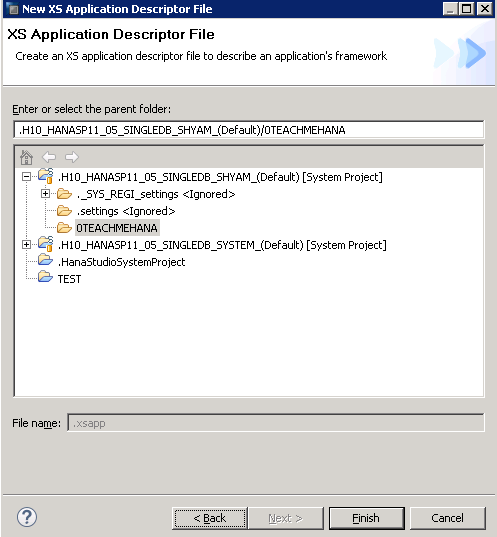 Check out the next page to continue the SAP HANA XS jobs tutorial. HANA SQL–How difficult is it?